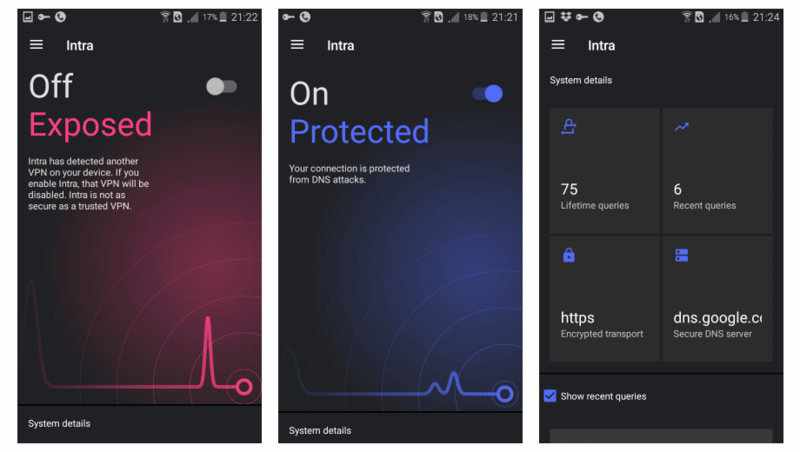 Google sister-company Jigsaw (previously) has released an Android app called Intra that encrypts DNS queries, which allows Android users to bypass one of the most common forms of internet censorship. At the technical level, the Intra app works by implementing "DNS over HTTPS" (DoH), a fledgling technology that will soon reach the status of internet standard with the Internet Engineering Task Force (IETF), the organization in charge of approving such technologies. DNS over HTTPS works by sending DNS requests and receiving DNS responses via HTTPS-encrypted connections. By encrypting all DNS traffic coming and going from a device, DoH keeps third-party observers from knowing what websites a user is trying to access. But DoH is not enough to safeguard the user's entire web traffic since the actual connection to remote services also needs to take place via HTTPS as well.